Our Hock Boot has a neoprene exterior lined with state-of-the-art fabric which contains polyester thread embedded with a fine ceramic powder. 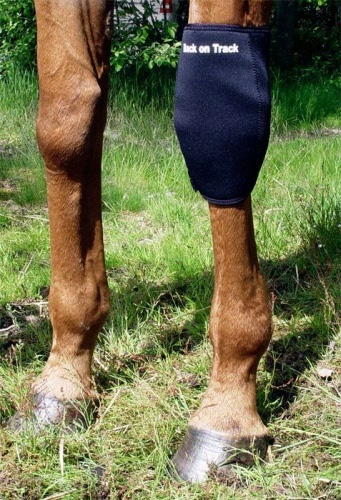 Designed to reflect the horse's own body-warmth, it creates a soothing far infrared thermal heat, which can help alleviate pain associated with inflamed muscles, ligaments, tendons and joints. Used for both injury prevention as well as injury recovery. Achieve great results when using for boggy hocks and arthritic joints. Back on Track products are not to be compared with magnetic therapy. Our form of therapy works with your horses own body heat. Hock Boots have holes for hock points. Avialable in small, medium and large in black.